I have to admit Halloween has never been a favorite holiday of mine, but I was prompted to write this jingle for a local poetry group I’ve been trying to attend. For excellent testing information that goes beyond what is generally offered (if it is even offered), if you have chronic health issues, please check out and share with your doctor Chapters 16 and 17 in my book. Little is being extended in the way of conferences for health care professionals in all facets of medicine, and certainly not enough testing info is offered unless you have full-blown celiac disease and do test positive. 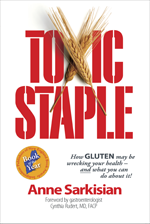 Too many folks test negative and told they don’t have a problem with gluten when in reality they are gluten intolerant. Catch this nasty monster before it overtakes your health.